When a green snake shows up in a dream, it typically symbolizes the resurgence of the dreamer’s connection with oneself. The meanings associated with green, especially when featured in a snake dream, are about nature, the earth, going back to what is true to you. In addition, the symbolism of the color green points to emotions and feelings, including hope and heartfelt connections. The dream interpretation should take into account any other personal associations you make with this color. What Does a Dream of a Green Snake Mean? Here are several meanings to help interpret your dream about a green snake. Because the color of the snake is green, the dream suggests that a transformation is occurring in your life quite organically, naturally, just like when plants grow on their own. Perhaps you are discovering new aspects of yourself or nurturing a relationship or project. To dream of a green snake indicates that you’re undergoing personal growth and inner transformation. Depending on the shade of the colored snake, you can find additional meanings regarding the quality and characteristics of your personal development. Green snakes are strongly associated with nature and the earth. What in you is moved by the presence of this snake in your dream? How does the creature or the dream relate to an earthy, natural part of you that is in the process of emerging? 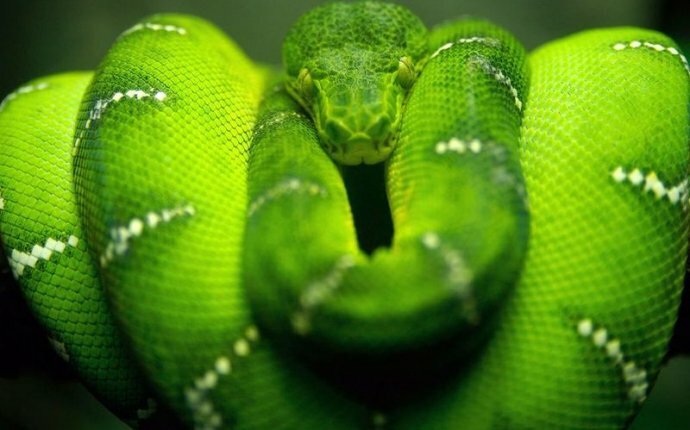 As green symbolizes what’s natural, earthy, a dream about a green snake may mean that you are reconnecting with more grounded qualities in yourself. At least, it’s a call to pay more attention to what helps you ground and find enough energy to support you in living and expressing what’s true to you and in you. The color green may point to some aspects of yourself or a project in your life that is not “ripe” yet; in other words, you are dealing with just the beginnings. Green on a snake is about the come back of the energy of positive change in your life. Depending on how the snake behaves in your dream, it could reflect how you are embracing or coping with the change: Are you experiencing it as aggression, threat, death of old patterns? Or are you at peace with this evolution? The green snake in your dream is then likely a call to take care of an opportunity for growth that you may otherwise be missing. It could indicate the need to nurture a bit more something that is just starting to emerge in your life, whether it’s new habits, a relationship or personal project. The shade of the colored snake will tell more about the meanings conveyed in the dream. Darker greens generally have negative connotations associated with jealousy, perhaps deceit. Lighter shades of green express opening up to healing, opportunity for growth. A balanced, healthy green suggests strength in your personal growth, steadiness and determination. It could also be a symbol for serenity, calm. Even though green is archetypally associated with nature, healing, and growth, your interpretation will benefit from looking within yourself to find out what green means to you personally. In addition, consider the behavior of the snake in the dream. It may give clues about how you are experiencing some changes that are occurring in your daily life.